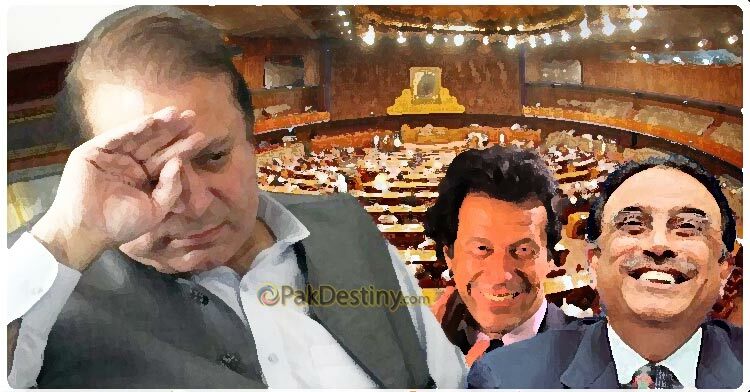 (Pak Destiny) A day after facing a humiliating shoe-attack in Lahore disqualified prime minister Nawaz Sharif received another terrible blow in Senate by losing both chairman and deputy chairman slot. Is it beginning of PML-N strong rule in the country? All indications are heralding this news. Nawaz is cursing his some allies for ditching him in Senate letting the opposition’s Sadiq Sanjrani become Senate chairman and Saleem Mandivwalla deputy Senate chairman. Nawaz’s daughter is so upset after the PML-N’s candidate Raja Zafarul Haq’s defeat. In her utter frustration she literally took on the establishment and called Imran and Zardari its pawns. She made a series of tweets targeting the leadership of PTI and PPP and also the establishment. On Monday Balochistan Senator Sadiq Sanjrani secured 57 votes defeating PML-N’s Raja Zafarul Haq, who managed only 46.